[14-2-2017] These days a silver grey metallic BX SPORT can be found driving along the roads near Roskilde, a town some 30km from Copenhagen, Denmark. It is not just a BX SPORT but in fact it has a certain history in the Netherlands. The owner drove the car very often with an implemented LPG installation. In July 1997 it was seen in storage with Car company van Soest in Bosschenhoofd and was kept there at least till late 2008. In 2014 it was in use with someone who drove the car until he decided to sell it. Then in 2016 Morten Ulrich from Denmark contacted us and told us that he had bought the car which is now carrying Danish license plates (BC 47159). His friend imported the car in the summer of 2015 and one year later he bought the car from him when his friend became sick. The LPG installation had already been removed so the car runs fine again on petrol. So after sleeping for quite a number of years there is again someone who enjoys driving it again!! 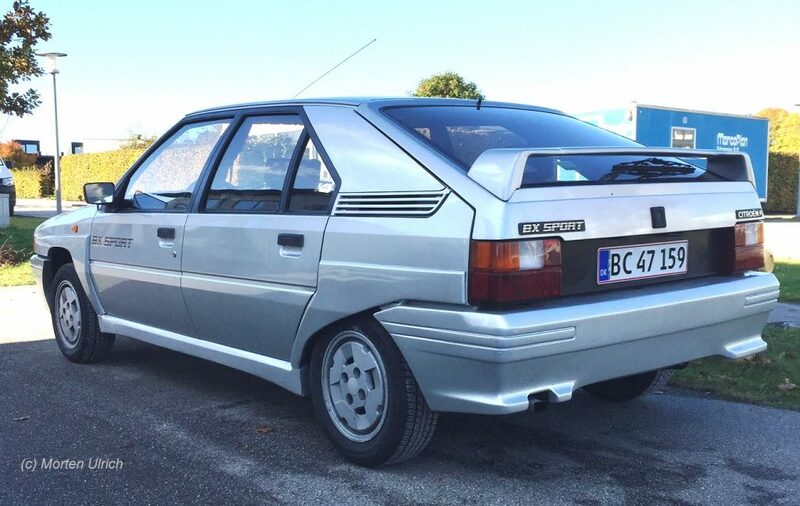 First thanks for your nice page about Citroen BX SPORT. I have bought Mortens Citroen BX SPORT in april 2017. I have got the car updated and it is now running perfectly. I hav run many Citroen in my time and now i enjoy this nice BX SPORT. Thanks for your information Lars, I hope you will enjoy the car for many years! !